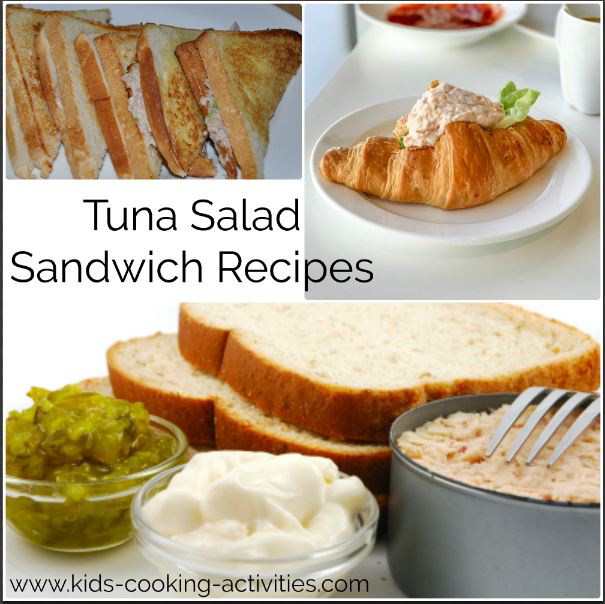 These tuna salad sandwich recipes are great for kids lunches or dinners, picnics, road trips or outings when you have a cooler. Please share your best tuna salad recipe, too! Stir all ingredients together and serve on bread or crackers. 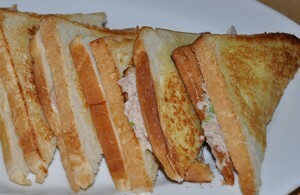 We like our bread toasted with our tuna salad sandwich. Mix together and place on toasted bread. 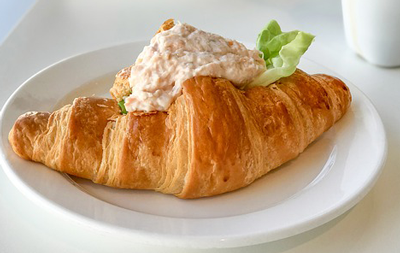 Combine a can of tuna, chunks of a tart apple (Granny Smith is good) and mayo. Combine and pack separately from pitas. After a hike or when you get to your picnic site spoon the mix into the pitas and enjoy! Chop eggs and tuna together in bowl with a fork. Stir in mayonnaise and season with salt and pepper. Add to bread, roll or croissant. Add chopped celery for an additional nutrition. If you chop it finely kids will be more likely to eat it, too. In bowl,combine tuna, cheese, mayo, pickles and seasoning. Flatten biscuit into 5 inch circle. Spoon 2 Tablespoons of tuna mixture onto one side of each circle. Fold dough over filling. Press edges with a fork to seal. Place egg and potato chips in separate bowls. Dip turnovers in egg, then coat with chips. Place on baking sheet and bake 375 for 18-20minutes or until golden brown. Allow to cool, then place in freezer bags. They are perfect for lunches so you can freeze 1-2 in a bag and take it out for lunch. Heat in the microwave or oven. 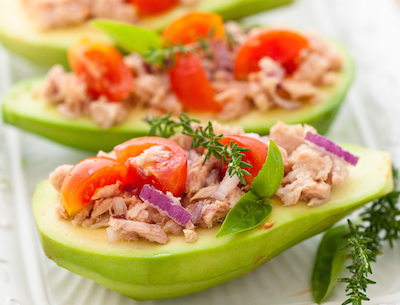 Stuff an avocado with tuna salad! Find more sandwich recipes here.